So as you can tell by the title, I’m engaged!!! And, yes, it was at Disney, in front of Cinderella’s Castle! A real life fairytale. 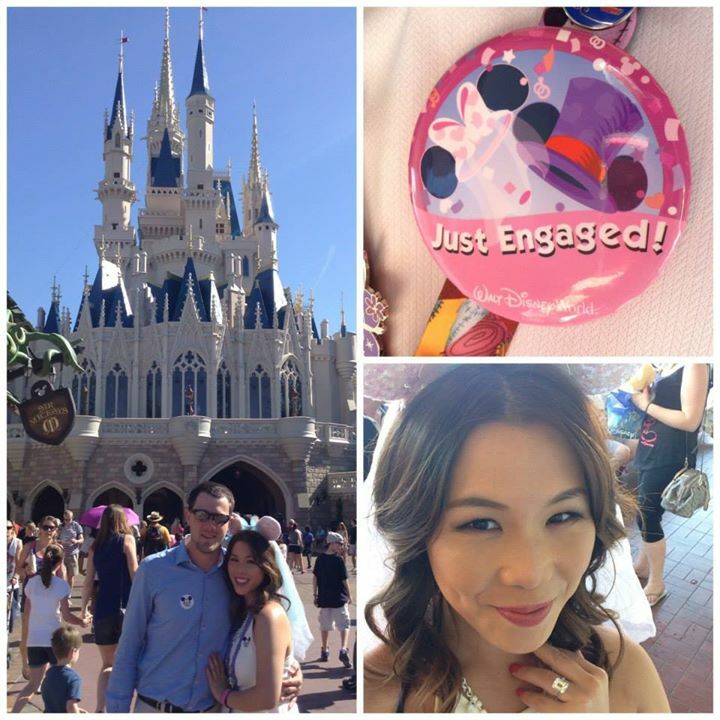 I thought to write a post with some Proposal Tips for Disney that explain some of the detail that made JJ’s proposal to me so magical. If anything, it may also be a good set of tips for planning your next visit to Disney. I’ve also started a new blog – One Day Bridal Blog – to follow the planning of both my Australian and American wedding, so feel free to check that out. Some of the proposal photos taken are at the bottom of this post. Actually, the proposal happened a few weeks back on 1 April (April Fools!) and it was a really nice time of year when the International Flower Festival was on at Epcot. JJ planned this amazing 4 day Disney vacation for us, and he really made all the effort to make the whole proposal special. I will write separate posts on other parts of our Disney vacation, so be sure to check out the ones to follow. This was by far the most genius thing that JJ pre-organised for our vacation. It a special photo package where any staff photographers around the theme parks will take your photos for you with their professional cameras at prime locations, and upload them onto your online account. You can get various packages for difference prices, but the Photo Pass Memory Maker allowed us unlimited photos. I know the packages are cheaper when you pre-purchase in advance, although you can still purchase in-park without pre-organising anything. This package meant that JJ and I didn’t have to lug a camera around, and the photographers were only too delighted to take photos of a newly engaged couple! Unlike handing your iPhone to a passer-by, the photographers were actually keen to help us take great shots, and we ended up using the photos from this package as an engagement photo shoot and pictures for our Wedding Save The Dates! It was also the perfect way to capture my candid reaction to JJ’s proposal, something you can’t do on your own, and that’s just priceless! 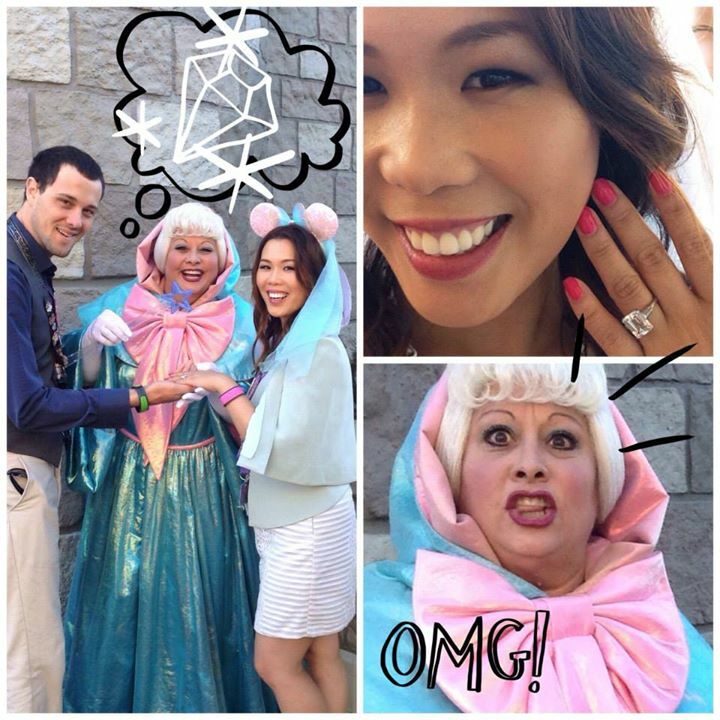 Fairy Godmother makes my wishes come true and admires my ring! This was a small but vital detail that made the celebration last all 4 days! 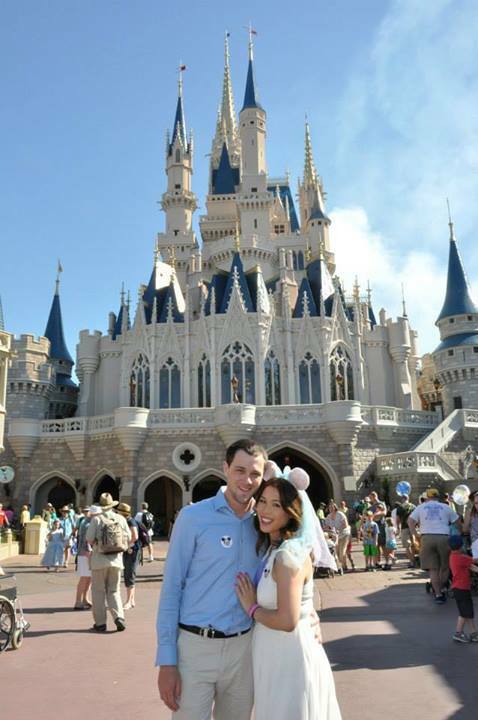 After JJ proposed to me we ran over to Guest Relations Service Desk by the entrance of the Magic Kingdom, and we asked for a Just Engaged! badge/button to pin on ourselves (image at bottom of post). You can get them for Birthdays, Anniversaries, Weddings, First Visits, etc. Wearing it identified us to all the staff and park visitors, and we were applauded, congratulated and given special treatment for the whole 4 days! There’s nothing more fun than having Fairy Godmother ogle your engagement ring Haha!. It was a simple but great way to keep the excitement alive the entire trip, and all that positive energy was so uplifting, even when we were exhausted from walking the parks. 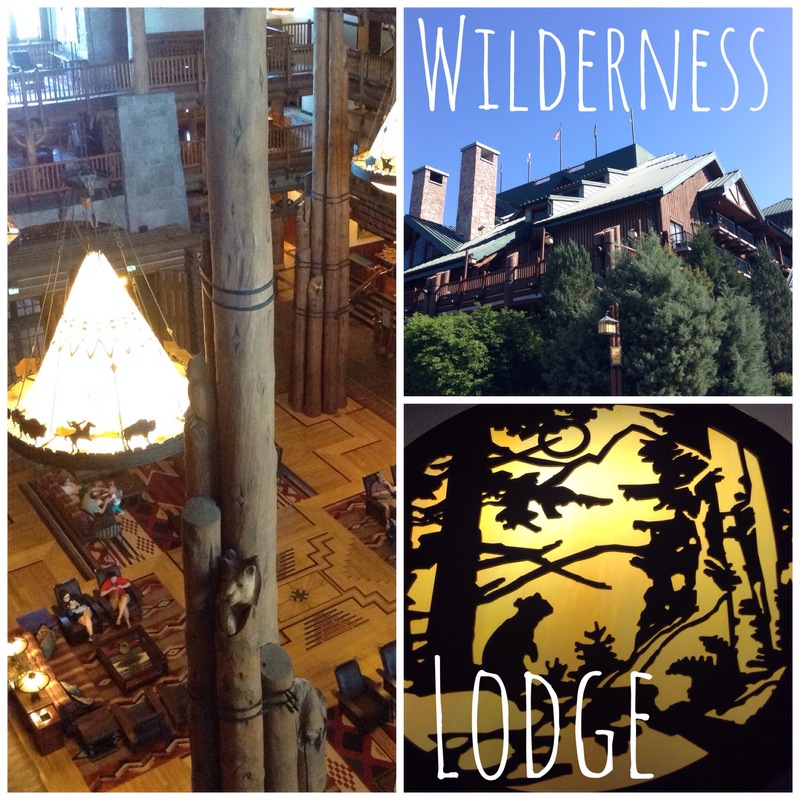 JJ really went the distance by booking us deluxe accommodation at Disney’s Wilderness Lodge. He must have told them beforehand of his wish to make this a magical proposal to me, and they gave us an upgrade to one of the Honeymoon Suites! The staff even left special gifts for me around our room like Disney collector pins, a Tinker Belle pendant and chocolates on our bed. The Wilderness Lodge was by far one of the coolest places I’ve stayed. It has a live geyser, amazing pools, awesome themed lobby, and really convenient transportation to the parks. Magic Bands for Magic Time! These are a very recent but great tech feature that Disney offers to park guests for a seamless and efficient experience. It’s a waterproof band you wear to scan for everything from: any merchandise or food purchases, fast-passes, key for hotel door, photo pass online account, and more! You can choose your own colours, and customise your design, as well as have your name detailed on the inside of the wristband. They get delivered to your home before your trip and it’s a great way to get excited in advance of your trip. You can also reuse them for all future visits! So Disney is the ultimate master of efficiency, and their smart phone app is no exception. The Disney App allows you to view the wait time for any attraction around the theme parks, and you can even use it to book and reserve dining at their restaurants. It enables the booking of fast-passes, and changing them when you want to, and has interactive maps to navigate the parks. Think Lost & Found, First Aid, anything, in just a few finger taps. That and there’s free WIFI everywhere around the theme parks. This is a world of knowledge in your palm! For those of you who are planning a proposal at Disney, check out what they offer to add to the occasion. Proposals happen A LOT at Disney (there was one a table over from us at Cinderella’s Roundtable Breakfast), and they know how to put on a show. 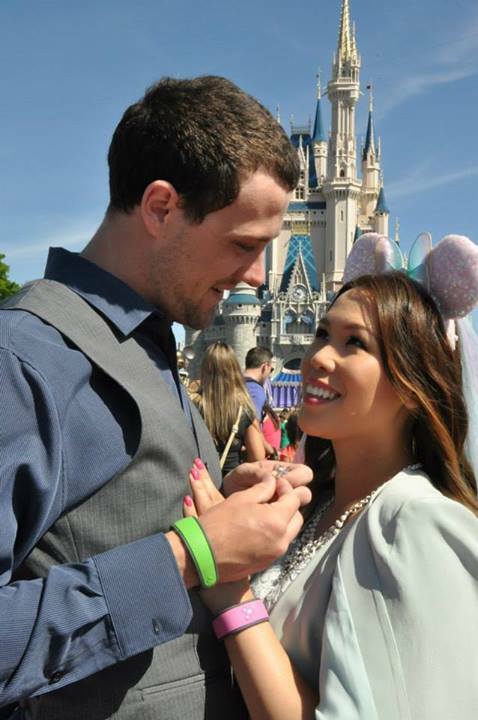 Check out their wedding website for some good leads, or just Google some Disney wedding blogs like this one. For those of you planning a vacation, I can highly recommend the Pass Porters Guide to Disney World. There’s so much that Disney can offer, and you can really make the trip larger than life if you know what opportunities are out there (many of which are free!). JJ and I have traveled many places around the world for our “Pre-Honeymoon” vacations, and Disney is just the least stressful and most positive place to go. You can really tickle the imagination of your inner child, and just let yourself get carried away with the magic of the place, because it’s the only destination in the world where you can be that way without seeming immature. On a practical level of comparison, there is a lot of walking, heat and crowds to put up with, but at the end of the day, Disney’s efficiency and customer service is second to none anywhere around the world. 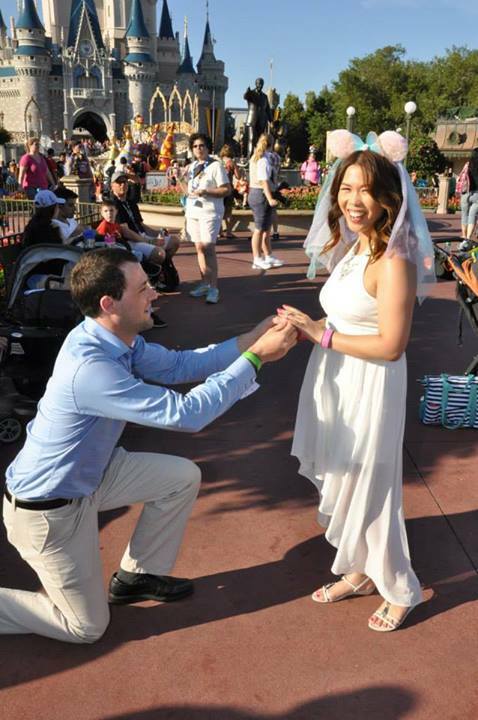 Being proposed to at Disney brought the experience up to a whole different level, and I just can’t compare it to any other way it could have happened. A smile goes a long way to making an experience positive, and there are a whole lot of smiles at Disney. It was, simply put, quite magical! The photographers at the park helped us take this shot. It was used for our wedding’s Save The Dates! This is a candid shot of JJ proposing to me. What a great moment! 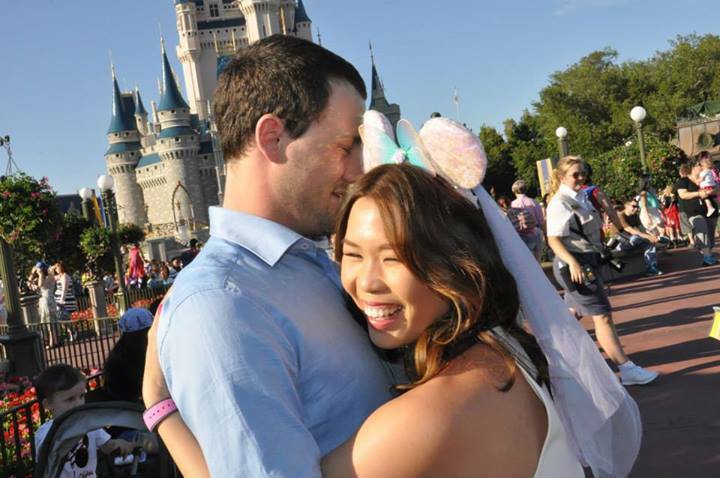 This is how I responded to his proposal… by squishing my Mickey ears into his face! Haha! Our Just Engaged! Badges made the trip so enjoyable! What a great story…. very special and one to share for years to come! Love the pictures, too.So happy for you and JJ. So impressed with how he engineered a very wonderful proposal trip! Thank you for the positive feedback! I so glad to know that someone found it useful. If you have any specific questions, feel free to ask! ← Hello I’m Back and I’m Engaged!